Wessex Cardiology has a fully staffed administrative, secretarial and non-invasive cardiology service. 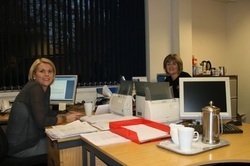 Our offices are open Monday-Friday 9am till 5pm when any of our staff will be delighted to answer your enquiry. Dr James Wilkinson is the Administrative Partner for Wessex Cardiology LLP. Donna joined Wessex Cardiology in April 2006, having previously worked for the senior Cardiac Surgeon and Clinical Service Director at the Wessex Cardiothoracic Centre, Southampton General Hospital. She has a wealth of knowledge in relation to cardiac services. Donna Bulfin is the Wessex Cardiology Partnership Manager. Donna's main responsibilities are the management, administrative and account services for the group in addition to co-ordinating all medico-legal work. Donna is the main secretarial contact for Professor Nick Curzen, all medico-legal work, co-ordination of sports screening and finances. ​Donna is married with two children, lives on the edge of the New Forest, enjoys eating out, going to the gym and spending time with her young daughter. Contact Donna by clicking here. Jane joined Wessex Cardiology in 2010. She is an experienced medical secretary in the cardiac field and is the main secretarial contact for Dr Alison L Calver, Dr Simon J Corbett, Dr Peter J Cowburn, Dr Andrew Flett and Dr Iain A Simpson. ​Jane is married and has three grown up children. Jane enjoys going to the gym, yoga and walking. Contact Jane by clicking here. Lisa joined Wessex Cardiology in February 2019. Prior to joining Wessex Cardiology Lisa worked for many years for Spire Southampton and prior to this has experience in marketing and sales. She is an experienced medical secretary in the cardiac field and is the main secretarial contact for Dr Peter Golledge, Professor Huon Gray, Dr Paul Haydock, Dr Drew Rakhit, Dr John Rawlins, Dr Benoy Shah and Dr James Wilkinson. ​Lisa is married and with grown up children. She enjoys time with her family now that she no longer has to work late into the evenings. ​Lisa enjoys eating out, walking, reading and foreign travel. Contact Lisa by clicking here. Kirsty is a fully qualified senior cardiology physiology measurement technician and is responsible for delivering the non-invasive cardiology service in conjunction with the medical staff. Lucy joined Wessex Cardiology in January 2017. She has over 19 years of experience as a Cardiac Physiologist, and has been a highly specialist Echocardiographer for 15 years. Lucy is accredited to The British Society of Echocardiographers, and is also a member of The Registration Council for Clinical Physiologists. Lucy is proficient in all areas of Echocardiography, including Adult, Paediatric and Adult Congenital. Lucy is married, with 3 children, and enjoys keeping fit and reading.